This ladies chunky knitted headband and neck warmer are sure to keep you cosy and warm. It has been designed by Drops and will be made to order using Drops Polaris yarn which is 100% wool. Black lace cat ears headband for Halloween. These kitten ears are hand made by me in the UK and ready to ship! Made from black felt, overlayed with pretty lace fabric. The lace is raw and you can just see through around the edges. These are attached to a narrow satin ribbon covered headband, Meow. Get them in good time for Halloween, buy early! Ariana Grande original white lace cat ears headband. I made this headband for lovely Ariana Grande. Pretty angelic cat ears made from see through lace, stitched over millinery wire to stand up. These are attached to a satin ribbon covered headband. All hand stitched by me, Meeow!! Height about 7cm . A big thank you goes to Ariana for supporting handmade! She looks stunning in this outfit! Deep red roses veiled flower crown. Deep red roses garland crown headband with a mysterious black veil. Headband fastens with woodland twine and long black ribbons. Looks lovely worn and great for pretty Halloween or Day Of The Dead vibe. Orange hairband handknit from pure British wool with crochet flower. I have hand knit this stylish hairband from a lovely bright orange shade of pure soft British wool spun in Yorkshire, and decorated it with a pretty little cotton crochet flower. Listing is for the bunny ears only, the veils are available separately. 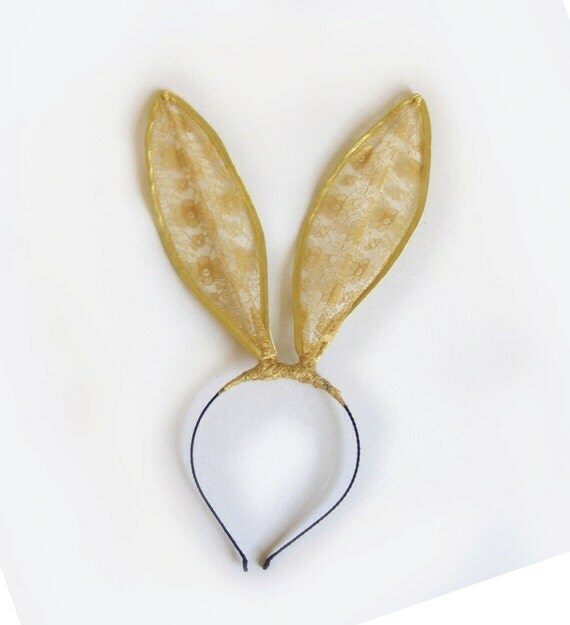 Wire is threaded around the satin bound edge of the gold lace bunny ears and mounted onto a silver headband, which I have wrapped in satin ribbon. This item is machine and hand stitched by me, in my Cotswold studio, in Royal Avening, Tetbury. Ears are approx 9" long and can be manipulated, to suit. Limited edition denim bunny ears headband for women. 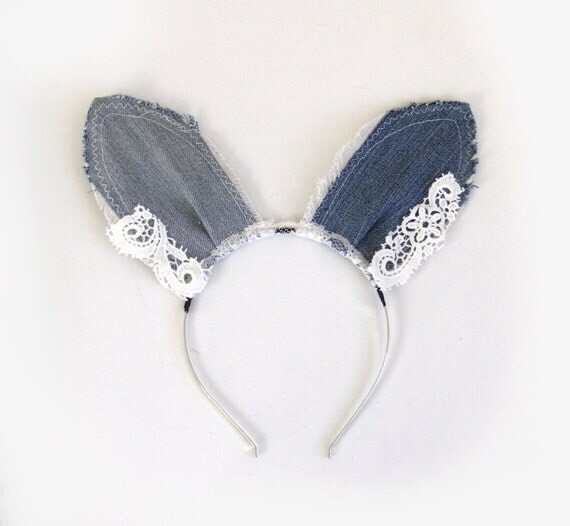 I have used washed upcycled blue jeans denim to make these very cute 5" high bunny ears. They are machine and hand stitched by me, hand frayed edges, with a mesh backing and pretty crochet and lace trim. Totally bang on trend for this summer's vacation must have, denim with crochet, wear with washed out denim and crochet hot pants! Cute handmade baby girl headband. White stretchy crochet baby headband with a big white hair flower. The flower is attached to a partially lined alligator clip and may be remove and worn separately. 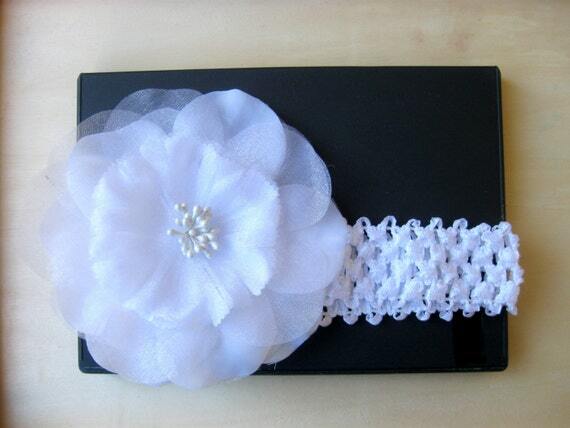 Great hair band for baby dedication, baptism etc. White crochet headband for newborn babies, infant, toddlers and little girls. 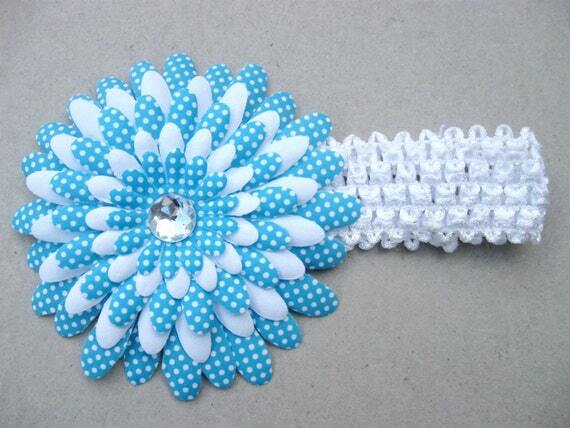 The blue and white polka dot flower is attached to the headband and measures 4" in diameter. This white head band is wonderful for photo shoots as well as every day wear. A wonderful ear warmer headband carefully hand crocheted in a pink and a fawn yarn to give a mottled effect. A large crocheted flower emblem with a pink surrounded has been securely hand sewn onto the ear warmer headband. The flower looks great worn either to one side or at the front on the forehead. 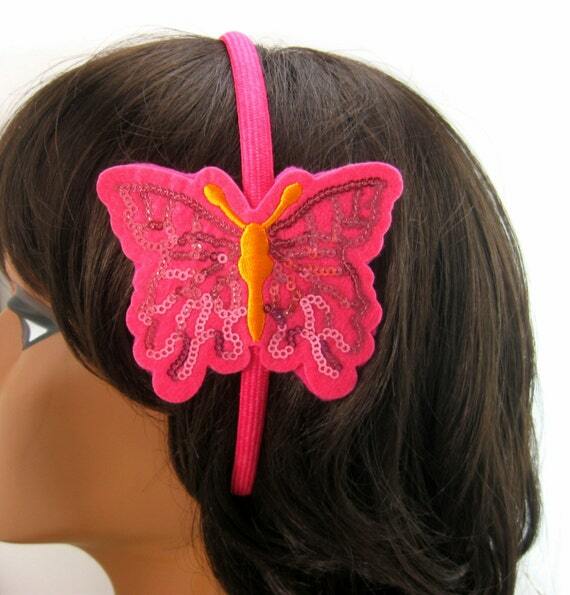 Pink felt butterfly headband great hair accessory for any tween/teen girls. Great for those who loves the outdoor as well as a great summer fashion. Headband is very flexible and will fit even a smaller child. 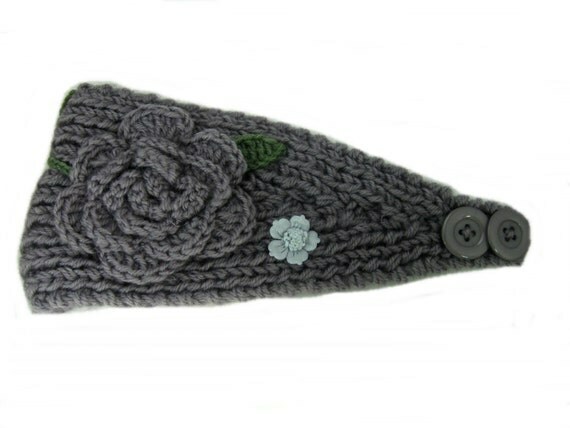 This gray headband/ear warmer is a great accessory for the winter months. Headband will fit most teens and adult heads. Crochet headband measures 17 1/2 inches and is great for any hair type. Recommended care: hand wash. Pink flower headband for babies and toddlers. 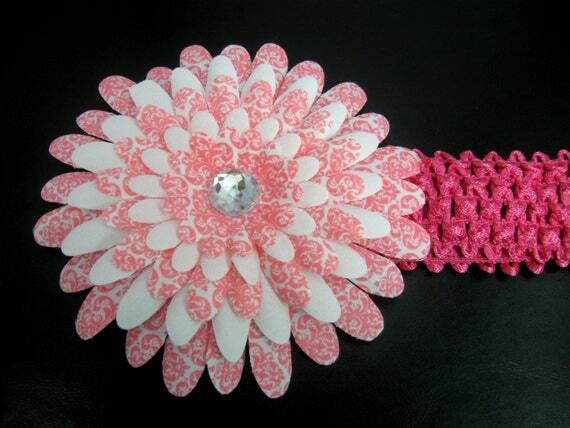 The flower is 4" in diameter and is attached to the pink crochet headband. Headband is very soft and comfortable for a child's head. Headband is very stretchy and will fit an older child as well.